In Limbo, Al Simmons is visited by “God” in the form of a dog he had as a pet during his childhood. “God” tells him about what has transpired on Earth since he committed suicide, including the death of his wife Wanda Fitzgerald. An angry Al, grief stricken is beckoned by “God” to take the sword of the spirit and return to Earth. “God” also mentions that there were mysterious forces and beings who manipulated Al to get him out of the picture so they could take control of Earth. Wanda’s soul has been taken to hell to be with the unborn son she had with Al. Simmons take’s the sword and lands on Earth filled with righteous fury! Jonboy’s art rocked my socks off from start to finish. I’m assuming the “god” which shows up here is the mother of “Satan” and “god” who used Wanda and Terry Fitzgerald’s twins as their vessels way back in Spawn history. Taking the form of a dog was…..interesting. 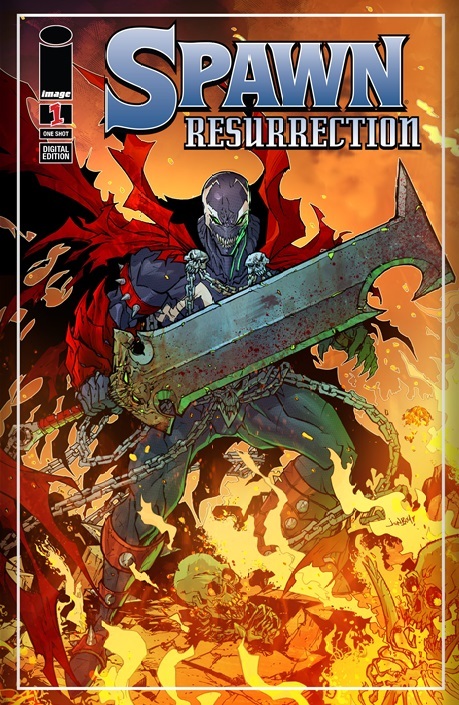 I enjoyed the reintegration of Al Simmonsinto the titular role of the Spawn series. There are more soft reboots in this book than I can keep up with. First Wanda lost the kid she and Al would have had because he was physically abusing her. Mammon took the kid which went on to become Morena. Now he and Wanda had a son which also didn’t go full term? Oh Jesus! This is becoming the weird unheard of adventures of Charles Xavier all over again. It didn’t help my love of his character and it sure as hell isn’t doing anything for me as a fan of Spawn. The visuals were the main seller for me because despite Wanda dying it just felt hollow and emotionless which is sad when you consider how long the character existed as the emotional center of all things Al Simmons. This actually looks like it’s good. I lost interest in Spawn so many years ago. Me too! Time to get back into it Coretyt! He looks a lot like venom.